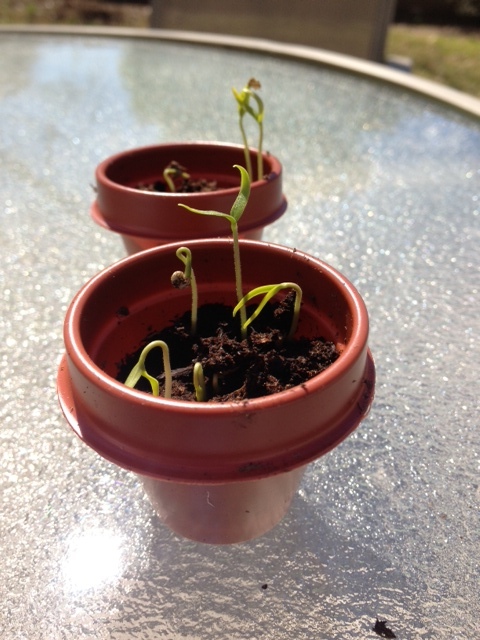 My little pepper plants are uplifting to watch as they grow. It is hope eternal. The seeds get a new beginning and a new opportunity at life. What about people? Can we plant ourselves in the ground and add water for growth? I think the dirt would mess up my hair and get under my fingernails. There must be another way to grow people. As I sit here watching over a dozen pepper plants as they push their way through the dirt and up to the sunshine, I can’t help wonder if all the plants will survive. In 2 weeks how many plants will I have? Do seeds weed themselves out like poor students or bad ideas? Surely the fittest plants will survive. Like people, it is all about genes. No matter how many survive, I will definitely have plenty of peppers to eat. For me, the growing isn’t the peppers (the outcome), it is the adventure of growing something. It is my internal growth that results from this growing experience. Isn’t life just one long journey for growth? A child learns to walk and suddenly they are running. Next they are learning to run a marathon. Learning and growth should never end. Even if I stop getting taller like a plant, I hope I am getting smarter. Not to learn results in moss under your feet. Boredom. No will to live. Whether you plant your seeds (or yourself) and watch the growth or you travel the world, it is the growth inside that is critical. How are you growing today?